Dedicated deadlift bars are becoming a big thing. I’ll be comparing a few popular power bars specifically for how well they perform as dedicated deadlifting bars for intermediate and advanced lifters. Deadlift bars are a specialty type of power bar that caters specifically to deadlifts. It makes sacrifices in other areas when necessary to make it even better for deadlifting. Every one of the bars I’m reviewing here are really nice bars. If they were crap, I won’t include them. And hopefully I’ve included all the top ones. What would a perfect deadlift bar be like? While there’s nothing wrong with trap bar deadlifts, it’s not what I’m talking about in this article in terms of a deadlift bar. I’m talking about only straight bars. Trap bar deadlifts are an excellent lift, but they don’t involve the same muscles, to the same degree, as a straight-bar deadlift. With a straight bar you have to bend over more, involving your back and hamstrings, while with a trap bar the movement turns into more of a squat. Some lifters do both. A traditional deadlift is not to be overlooked, because it works your back, glutes and hamstrings so well. Some lifters only use trap bars because they have an issue with straight bars hitting their knees or shins. This is a form or flexibility issue. Start with lighter weight, warm up, stretch, and watch videos on good deadlift form… like this one. Aggressive knurling is a must. Aggressive knurling doesn’t just mean it’s cut deep. It’s a whole science in itself, based on how it feels and how well your hands grip it without it feeling needlessly sharp. Eventually, every lifter learns that the weak point in his deadlifting game is his grip. His fingers start to slip, and he starts to appreciate aggressive knurling. The finish/coating of the bar needs a certain amount of “tack” to it to keep your hands from slipping too easily. Chrome is notorious for getting slippery when wet. It’s just too smooth. Black oxide has a good amount of tack. Black zinc is also good, similar to black oxide. Everything but chrome can give you a good grip. Bare steel has also become popular. Black oxide and zinc can both wear off with enough use, leaving bare steel underneath. This is not unusual. Still, it’s some of the best coating. You might just need to wipe some oil on it occasionally to prevent rust. The other thing to keep in mind with the finish is how thin it is. The thinner the better. A thick finish will fill in part of the depth of the knurling. Why go to all that trouble cutting deep knurling if you’re just going to fill it back in? This isn’t the knurling but the non-knurled rings spaced 810mm apart for the International Powerlifting Federation specs. The spacing here doesn’t matter if you’re using the same bar all the time, but if you aren’t, it helps to know for sure that you’re holding the bar in the same spot each time. Having a powerlifting bar with IPF spaced rings is most appropriate and consistent. Normally, powerlifting bars have a shaft length between the inside collars of around 52″. This way the shaft is wide enough to fit over a 48″ / 120cm wide olympic bench rack or power rack with some room for slop. The overall length of the bar is roughly 86″ / 7ft / 220cm. A few of the bars here have an extra long shaft, about 56″ instead of 52″, while the sleeves stay the same length as other power bars. The long shaft isn’t needed for grip. I mean, some athletes have a wide grip, but deadlifts are not one of those wide grip exercises. What the long shaft does is flex more, and that helps spread the load over time as you lift off the floor, giving you an extra advantage of not heaving to pull 100% of the weight from the very bottom. Think of it this way: When the first few inches of the pull weighs less, due to the plates not clearing the floor yet, wouldn’t that make it easier? So yeah, you might think of it as cheating. In the end, though, you still have to get the weight up. Also I should mention the “whip”. This is a term used more for olympic lifting, but with a fast enough deadlift you can utilize the whip too. It is directly related to flex. Basically it’s how much you can use the flex to “whip” the plates up into the air. With deadlifts it’s very slight, depending on how you do the exercise, and only at very heavy weights. That being said, you do have to be lifting a lot of weight for the steel to start to flex. It varies, but let’s say 315 lbs / 140kg with a sumo grip (narrow grip, hands between legs), and 405 lbs / 180kg with a conventional grip. If you’re new to this, those numbers just correspond to three or four 45lb plates per side. If you aren’t lifting that much, you won’t get this benefit out of the bar. Just about the only disadvantage to deadlifting with this kind of extra-long bar is if you’re attempting the Reeves deadlift. Never heard of it? Check it out. Also, don’t use this kind of bar in a power rack. It’s too susceptible to being permanently bent if you drop it on the safety bars, with the extra torque at the ends. So don’t try benching with a deadlift bar, or squatting, or anything else. One type of bar that is not publicly available anywhere is the Elephant Bar, made by Rogue exclusively for the Arnold Strongman Classic. It is more flexible than a regular bar, and it has 27″ long sleeves instead of 16″. The center shaft between the inside collars remains the same length, 52″. Again, you can’t get an Elephant Bar anywhere as of writing. But it comes up every now and then when people watch the Arnold Classic, so there you go. The other thing about the shaft is the diameter should be thinner than a traditional 29mm powerlifting bar, or even a 28mm weightlifitng bar. A thinner bar is easier to get your hands around. To illustrate this, try pulling on a 2″ pipe that you can’t even get your fingers around to touch your thumb. Your grip fails REALLY quickly. Fat bar training is a whole different area of training, where people use 1.5″ and 2″ bars to work their grip strength. 27mm is what the manufacturers have settled on to provide for a stronger grip. Strength of the steel also becomes an issue with thinner bars. While we’re still on the subject of grip, consider learning to use a hook grip for your deadlifts. EliteFTS wrote a good article on 3 critical deadlift lessons most lifters never learn, one of which is the hook grip. This is the new popular specialty deadlift bar. It came out in 2016, making it much newer than the others. I’d call that a good thing. Rogue knows what they’re doing. They put real research into their equipment. The employees lift. You won’t find anyone saying that they bought something from Rogue that was low quality. This video really shows the flex of these extra long 90″ bars. He also talks about the knurling and how it really isn’t that bad on his hands despite going over 400 lbs. But the flex on this bar is reportedly not as high as the Texas Deadlift Bar, further below. 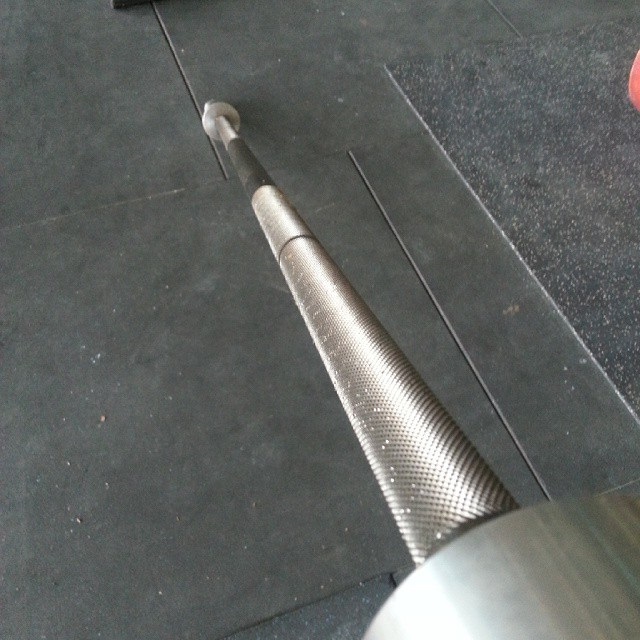 The knurling feels a lot like the Texas Deadlift Bar. They cut it really deep and round off the peaks, making it grip really well without too much bite. Despite the extra length, the 27mm shaft makes up for the weight, putting the bar at the same 20kg / 44lb weight as other power bars. See Cody’s review of the Ohio Deadlift Bar. The classic bar manufactured by Buddy Capps. The end cap has the state of Texas logo. As you can imagine, it’s made in Texas. (Capps is not the same as CAP, a Chinese manufacturer… And not to be confused with the end “caps” as noted above. We need more words!) This bar is known for its deep, pointy knurling. See below. This kind of knurling provides a killer grip, but there’s a reason most bars out there don’t have it: it can hurt with a lot of weight. But there’s no denying how well it grabs onto your palms to keep from slipping. That’s the whole appeal of it. The knurling pattern is an important thing in that it’s not only about how deep the knurling is but how how flat or pointy the tops of each diamond are as a result of the knurling process (space between knurls and depth of cut). As shown, you can see that it does leave flat tops, but compared to other bars this is still fairly pointy and deep. Other than that, it’s the quintessential power bar. 28.5mm shaft, 7ft length, black zinc finish. It’s a popular bar that some people feel is the best one they’ve ever had. The sleeves are 15″ long, which is about average. Running out of length on the sleeves on any of these bars is not normally an issue unless you’re using bumpers (which are thicker than iron plates) or you’re a beast. This is a popular bar still, and for years it’s been used as a deadlift bar. The thing is it is a very stiff bar. You won’t get any flex out of it unless you’re putting up huge numbers, and even then it’s minimal. So it’s not a specialty deadlift bar, but plenty of people love it for deadlifts, along with presses and squats. 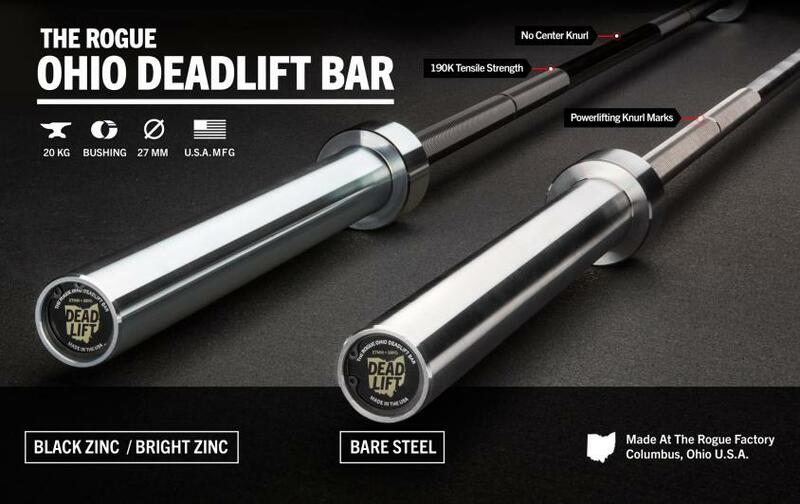 The Texas Deadlift Bar has huge inside collars and a loadable sleeve length of 14 3/8″. The 56″ shaft is significantly longer than the typical 52-53″ of other power bars. The longer shaft and big collars have the effect of providing more flex to the Texas DL bar on your pull before it clears the floor, because the plates are further out and there’s a longer shaft to flex. This was an intentional design feature. These 7.5ft deadlifting bars create a problem if you have an 8ft residential ceiling to content with and you want to store your bar in a vertical bar holder. If you’re careful you should be able to just barely store a 7ft bar that way. The knurling is the same as the Texas Power Bar (no surprise there). See the close-up image above. Texas Deadlift Bar has been reported to have the most flex, about the same as the Rogue Deadlift Bar. 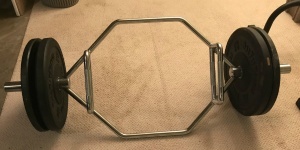 In contrast with Rogue, weight of this bar is 45 lbs, not 20kg /44 lbs and is therefore meant more to be used in competitions where pounds are the denominated weight. See Nikita’s side-by-side review of the Ohio and Texas Deadlift Bar. 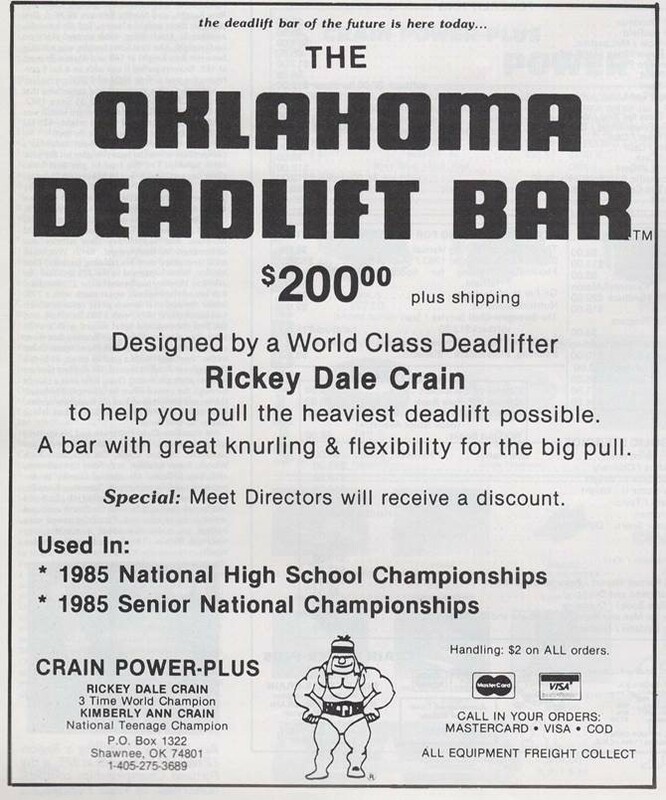 The Okie was the FIRST deadlift bar made to these kind of specs, originally sold as the Oklahoma Deadlift Bar in 1984. 1985 ad – Thanks to Rickey Dale Crain for sharing this with me. Sorry folks, it’s no longer sold at 1985 prices. Its other claim to fame is it has been used in tons of local, state, national and international lifting competitions over the years. In other words, it’s a proven favorite of heavy lifters. The design is perhaps dated, so be sure to see the details on the upgraded Okie Extreme Deadlift Bar, further below. The Okie Deadlift Bar has 15 15/16″ sleeves, pretty long. You’ll fit another plate on each side compared to the others. Like the Rogue, it weights 20kg / 44 lbs. This bar is pretty rare. You can only get it online from a few places, like Crain (the manufacturer) or their dealer Lifting Large. Like the Texas DL bar, it has a longer shaft. The point of the longer shaft on these bars is so they will flex more, so you don’t have to lift the entire load starting at the bottom position. It does take a lot of weight for this flex to come into play. I couldn’t get a tensile strength rating for this, but my guess is it’s got to be right about the same as the others. The strength isn’t going to be an issue. The flex is about like the Rogue Ohio Deadlift Bar. As far as knurling goes, it feels pretty similar to the Texas DL bar, but it’s not quite as deep so is a little easier on your hands between the two. Here’s something interesting. This bar doesn’t have bushings in the sleeves. The sleeves are just steel on steel. For deadlifts, you know, maybe that’s a good thing. You don’t want the bar to rotate out of your hands. I’m told the Okie has pinned sleeves. Rogue is definitely snap ring. It’s just the method used to secure the sleeves. Rogue talks about it like snap ring allows for a better spin, but I don’t know. Snap rings – A little better spin than pinned sleeves. Bronze bushings – Definitely for better spin! Bare steel shaft for an even better grip. Zinc plated sleeves for less scratching from plates and better rust prevention. This bumped up the price of the Extreme by $120. The bare steel shaft is technically removing a feature, but many lifters prefer bare steel over zinc or any other plating/coating because it gives you the absolute best grip for heavy pulling movements. You just need to make sure to rub it down with oil every once in a while. One more thing you could do is get a 25mm women’s bar with deep knurling. The thin shaft makes a big difference in what you can pull raw. See Rep Fitness’ 25mm Excalibur Bar v2. In version 2 they made the knurling deeper, making it perfect for something like this. A women’s bar has shorter sleeves, so keep that in mind as you figure how many plates you’re going to be able to load on it. You won’t be able to load it to 405 lb with regular bumper plates. All of these bars are great for deadlifts, depending on your situation, which is why I included them and not the hundred other bars on the market. Here are the quick reasons you would go with each of them. Rogue bars are popular for a reason. The 7.5ft Rogue Ohio Deadlift Bar is the newest one of the bunch and is getting great reviews. Everything about it is superb as a deadlift-only bar. It’s the only choice if you want bare steel, rather than a coating like black oxide. The 7ft Texas Power Bar is a classic pick if you will use it for other exercises. It’s a good all-around bar. It doesn’t have the crazy extra length of the dedicated deadlift bars. The 7.5ft Texas Deadlift Bar is what Rogue appears to have modeled theirs after. If you have any reason not to go with Rogue, this is a great pick. The 7.5ft Okie is becoming dated, but it was the original groundbreaking design, and there’s a certain fame behind it. Capps eventually copied the Okie, and Rogue copied it and Capps. There are some old rusty Okies out there (that’s what happens after 30 years if you don’t oil it) that people love too much to replace. If a powerlifting meet you’re competing in will be using the Okie, which is entirely possible, then it’s sure nice to practice your lifts on the exact same bar. The 7.5ft Okie Extreme is more like the Rogue and Texas DL bars than the original Okie. The price is pretty high, so I think you’re partly buying it for the proven brand name. in my “over 8″ hands” im not able to feel a difference between 27 and 28 mm shaft diameter. objectivly i prefer my 29mm for train and avoid bad surprising in competition…if im lucky bar will be thiner…no thicker.. (my 756lbs/ (342,5kg Deadlift was do on my 29mm… and for my coach diploma and in compet i despite of vaietybof Dameter/whippinedlss off bars i do same perf because grip isn my problem i pain just for ending movement no for pull ! if i want no tired my forearms and increase my grip strenght (like in rowing) i use 25mm barbell !!! I never thought of using high-PSI 25mm womens’ bars with aggressive knurl for deadlifting, but that makes a lot of sense. I’m going to add a note to this article suggesting it. Do you find a 25mm is easier to grip and pull than 27mm? Thanks for sharing your experience with these types of bars! I haven’t heard of Pallini before, but I found a French site http://pallini-sport.fr – That must be it?